You might spend more time using Facebook if you didn’t have to leave a browser window open, so today Facebook officially launches its Messenger for Windows free downloadable desktop client. But since an early tester leaked the download link in December and Facebook responded by making it publicly available, you might already have it. The client lets you persistently chat, receive notifications, and read your news feed from your desktop. Facebook says “For those of you on Macs, we’re busy working on Messenger for Mac right now. Stay tuned.” Facebook Messenger for Windows can be downloaded here for Windows 7, and it will be promoted to Windows users around the world over the next few weeks. Facebook has exhausted much of the supply of new users to sign up in many countries. The product demonstrates its shift to focusing on squeezing every last drop of engagement from existing users. 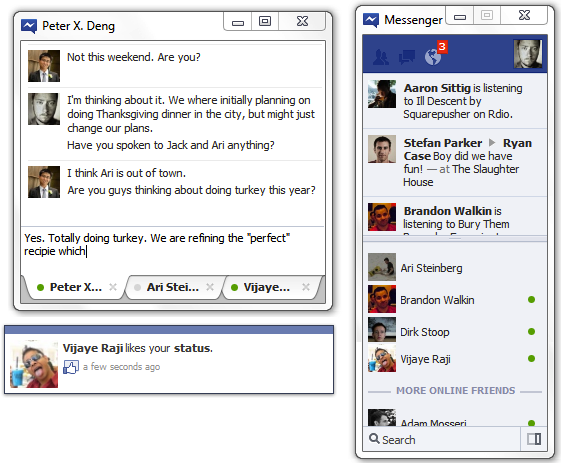 Offsite Facebook Chat has proven wildly popular. Microsoft’s Messenger Live site that lets users Facebook Chat, read updates from friends, and share is technically Facebook’s most popular app according to AppData, with 22.4 million monthly active users and a staggering 19.1 million daily active users for an incredible stickiness percentage of 85.5%. Messenger for Windows could bring some of this usage to where there’s no Hotmail, SkyDrive, or other Microsoft features to distract users. Facebook loves to test its products on small percentages of its user base to check for usage patterns and adoption rates before rolling them out globally. It even has a specially designed piece of infrastructure called Gatekeeper to manage who can see what. When testing browser-based products Facebook has full control, showing and hiding features to different users at will, with guinea pigs typically unable to opt in or out of tests. In testing one of it’s first downloadable desktop products, Facebook suddenly found it was the guinea pigs who were running the experiment. When a blogger for Israel’s TechIT was admitted to the Messenger for Windows test group after the product was announced in November, he was given an unprotected download link. He promptly published it. We picked up on the news and suggested Facebook face facts and publicly release the link for those desperate to download. That’s just what it did, making the client available in the Help Center, but making no formal announcement. Today that announcement comes. Facebook tells me the updates since the leak are basically just fine tuning and bug fixes, no features have been added, and the tester base has enjoyed offsite Chat access. Like Facebook’s standalone Messenger mobile apps, the Windows client is snappy and responsive, and lets users avoid the nagging feeling that they need to constantly check Facebook for new activity. With this and the forthcoming Mac client, Facebook may have found a way to blow past its own record-setting 7+ hours per month average time on site.